The Oregon standoff and the landowner’s right to burn. 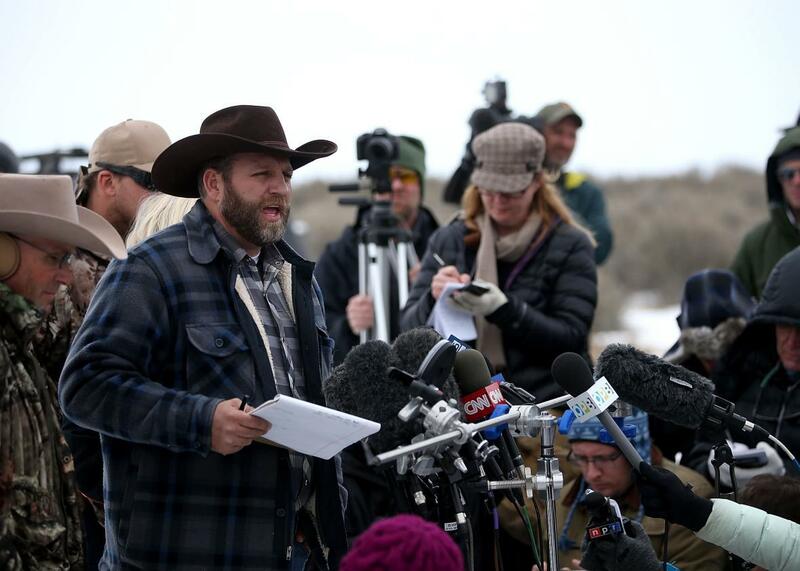 Ammon Bundy, the leader of an anti-government militia, speaks to members of the media in front of the Malheur National Wildlife Refuge Headquarters on Jan. 5, 2016 near Burns, Oregon. But the Bundy boys from Nevada claim that the Hammonds had a right to burn, that the penalties are unprecedented, and that force, or the threat of violence, is necessary to compel change. The federal government, they say, has no right to the land. Here (if they chose to quote Mao) was a spark that might start a prairie fire of revolt. Yet fire may not be the wisest choice for this causus belli. Fire on the land is complicated: lots of fires from lots of sources for lots of purposes. But they all, every one, carry the latent potential to spread beyond their point of ignition, and the issue is worse with smoke. That has given society a valid interest in how fire gets put in or taken out of landscapes. Legal constraints date back to the Old Testament, which declares that if someone’s fire burns another’s property, then “he who kindled the fire shall surely make restitution” (Exodus 22:6). In 1965, Johnny Cash was fined almost $1 million (in 2015 dollars) when an overheated wheel bearing on his camper truck set fires that burned into the Sespe Condor Refuge on the Los Padres National Forest. In 2006 Van Bateman, then assistant fire officer on the Coconino National Forest in Arizona, was sentenced to prison for arson fires. (He claimed he was only doing the burning that should have been conducted legally.) In urban or peri-urban settings, arson has historically been a capital offense. The political theater in Burns, Oregon, is not really interested in the question of fire management. But the recent history of wildland fire management may be relevant to the underlying politics. By now much of the American public knows that the U.S. fire community has tried to restore good fire to our national estate. Part of that fire revolution has involved federal policy, but much has been institutional. By the early 1960s, the U.S. Forest Service had become a benign hegemon, committed to fire’s removal from the scene. As a matter of public safety, the state—at all levels—had progressively assumed control over burning in what could seem a creeping monopoly. The upheaval that followed sought both to restore fire and to dethrone the Forest Service. What one agency had traditionally dominated became inter-agency, and then inter-governmental, and now includes a vigorous civil society. Much of the early reform emerged out of Florida and pivoted around fire’s historic ecological and cultural role. The reformers there wanted to establish a “landowner’s right to burn,” and through serial legislation they ultimately shifted the burden of proof from the burner to those who refused to burn. The system in place, overseen by the State of Florida, relies on a certification program for those who wish to burn along with a rapid-fire process for approving requests. The Florida model has spread throughout the Southeast, but it has not emigrated successfully elsewhere. Nearly 80 percent of the prescribed fire conducted by the National Park Service, for example, comes from Big Cypress Preserve and Everglades National Park, both in south Florida. But another Florida innovation has propagated widely. Beginning in central Florida, parties interested in prescribed fire organized local councils to promote the practice. These spread by example north and south, eventually coalescing into a statewide prescribed fire council. That exemplar has rippled outward, assisted by the Joseph W. Jones Center for Ecological Research in Newton, Georgia, and culminating in a national Coalition of Prescribed Fire Councils. By the end of 2015, some 25 states including Oregon had councils and another two were under development; the movement has even crossed into Canada. These are organized citizen groups, not governmental in any way, though they often have public entities among their members and they frequently cooperate on projects of mutual interest. They promote model legislation, pool equipment, circulate information, and conduct burns on one another’s lands. All this is less an expression of landowner libertarianism than of mutualism. The participants know that no one can alone afford the full cost of supporting a serious burn program, and they know, keenly, that a failure by any one of them will affect every one else. The Hammonds’ original fires are almost beside the point now in the Oregon standoff, but the fire councils might indeed offer an example of how to reform what might seem an overweening federal presence. In 1960 the U.S. Forest Service and its fire policy appeared impregnable. A formal insurgency began two years later when the private Tall Timbers Research Station organized the first of its annual fire conferences and the Nature Conservancy conducted its inaugural prescribed burn. By 1978 the Forest Service yielded to reform. It accepted as policy that the right fire needed to get back into landscapes and as an institution that it was, at most, the first among equals. The insurgents behind the fire revolution did it with symposia, with arguments in journals and op-ed pages, with legislation, with lawsuits, with demonstration projects, with tireless talking, with confidence-building programs, with neighbors helping neighbors. They won their firefight by reforming the system, not by trying to impose their ways with blowhard posturing and vigilantism. Prescribed burning was invented as a concept in 1942 to broker a compromise between those who wanted to suppress all fires and those who wanted no constraints on what a landowner might burn. It sought to encourage landscape fire but within intellectual and institutional disciplines. Twenty years later it helped underwrite a veritable revolution in land management. The fires of revolt can also be prescribed.